She graduated from the École Internationale de Théâtre Jacques Lecoq in 1975. She began her theatrical career in 1971 with Carlo Cecchi’s Granteatro. In 1978 she founded the Teatro Arsenale, a world inside the world, in Milan. Since that time this extraordinary place has become the ideal center of her ideas about drama and her work as an actor, playwright, director and teacher. Among other things she has staged productions for the Teatro La Fenice in Venice, the Festival Opera Barga, the Teatro Comunale in Bologna, the Ravenna Festival, the Teatro Biondo and the Antonio di Verso music association in Palermo, the Accademia Filarmonica Romana in Rome and other institutions. M.S. has a genuine passion for theatrical teaching, an activity to which she has devoted herself since 1976. The Scuola di Teatro Arsenale, founded in 1978 along with Kuniaki Ida, is well-known in Italy and abroad. 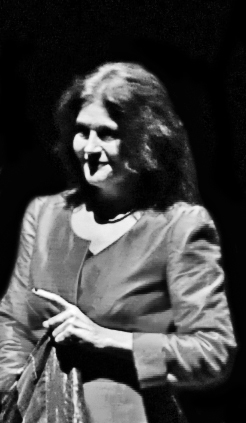 From 1999 to 2002 she was guest teacher at the École Internationale de Théâtre Jacques Lecoq in Paris. She has worked with Milan University and has given seminars at the Autunno Musicale in Como, the ?Festival of Youth and Art in Hong Kong?, the Colorado Festival of World Theatre and lectures and demonstrations on the school and the work that is done there. The experience she has gained over time working in nontheatrical spaces has led her to focus in recent years on the creative relations between drama and the space of performance, thanks in part to an ongoing collaboration with the Department of Architecture of Milan Polytechnic, with which she has staged performances and organized workshops.